Summer is coming to a close and teachers across the country are gearing up for the school year with lesson planning, supply shopping and classroom decorating. Every teacher wants to decorate their classroom. After all, it’s the space where they spend the majority of their day. Fun décor engages students and makes them excited to be in school and learn. It also gives teachers a break from the monotone cinderblock white walls, gray carpet, and bland drop ceilings often found in public schools. If you’re a teacher and you’re having a hard time getting your classroom game on point, we’ve got you covered. 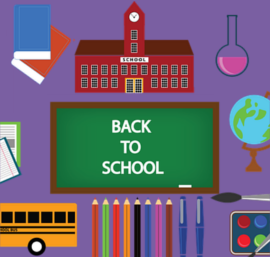 Head to our locations in Brooklyn, Queens and Hauppauge Long Island for classroom decorations and back to school supplies and out these classroom decoration ideas for major inspiration. Many secondary teachers feel they must choose between decorations that are juvenile or decorations that are boring. But there is a third option! Don’t watch the clock, solve it! Replace hours with math equations on the face of the classroom clock. Perfect for math classrooms, students will have to solve equations to get the time. Take it to the ceiling. Have a drop ceiling in your classroom? Decorate ceiling tiles or give your students an assignment requiring them to decorate ceiling tiles. Inspirational quotes, the periodic table, book covers, and constellations are a few ways to add color to your class in an unexpected way. Get social. Middle and high school students communicate with each other daily through Tweets, posts, Snaps, and pins. Give your classroom a social media theme, incorporating famous quotes and historical events in a “social” format. For all your classroom supplies head to Party Glitters locations in Brooklyn, Queens and Suffolk, Long Island.